Drops Magazines are imported from Norway, translated into English, and features Garnstudio yarns. 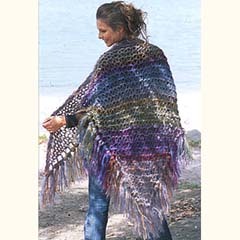 This beautiful shawl is made with Garnstudio Vienna (mohair) and Highlander (wool) yarns. The colors are vibrant. The kit includes the yarn necessary to complete the shawl, and a copy of Drops 86 magazine. The magazine includes the pattern for the shawl and a number of other lovely patterns. *Photographs are provided as a convenience to our customers. Each computer screen may display colors differently. Because of the differences in computer screen color display, the color that you see may not match the actual color of the yarn.